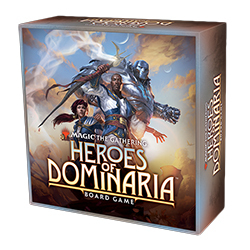 WizKids has updated solicit information for Magic: The Gathering - Heroes of Dominaria, the new licensed strategy board game releasing this summer. Wizards of the Coast has also shared a preview with images from the game. Earlier this week, the Standard Edition game price was updated to $49.99, down from $59.99; and the Premium Edition is now listed at $69.99, down from $79.99 (see �WizKids Unveils 'Magic: The Gathering' Board Game�). WizKids confirmed there has been no change in the game components.